The Hadassah Foundation is seeking nominations for its annual Bernice S. Tannenbaum Prize. The Prize honors the achievements of an up-and-coming feminist leader--someone who is making a positive impact on the lives of Jewish girls and young women in the United States, or for Israeli women. It also provides the winner with something that is all-too-rare in the Jewish community: funds to pursue a professional development activity. All (electronic-only) applications are due by Friday, March 4, 2016. More information can be found at www.hadassahfoundation.org. The Hadassah Foundation is sad to mark the passing of Elizabeth Swados earlier this month. Ms. Swados, who was a gifted writer, musician, composer, and theater director, was the recipient of one of the Foundation's first grants in 1999. She, in collaboration with the JCC in Manhattan, received support for Jewish Girlz, an original musical that addressed the problems and joys of being a young Jewish female in the United States. Liz wrote the musical with a group of young teen girls who performed it at the JCC. We will miss her powerful voice! The Hadassah Foundation is seeking proposals for projects, curricula, and training programs that will enhance the leadership capacity of Jewish girls and young women ages 12-30 in the United States. All applications, to be submitted by email only, are due by February 5, 2016. The grant term will be July 1, 2016–June 30, 2017. The Foundation will provide a limited number of grants of up to $40,000. Complete guidelines, as well as the cover sheet and project budget sheet that all applicants are required to use, can be downloaded at www.hadassahfoundation.org. 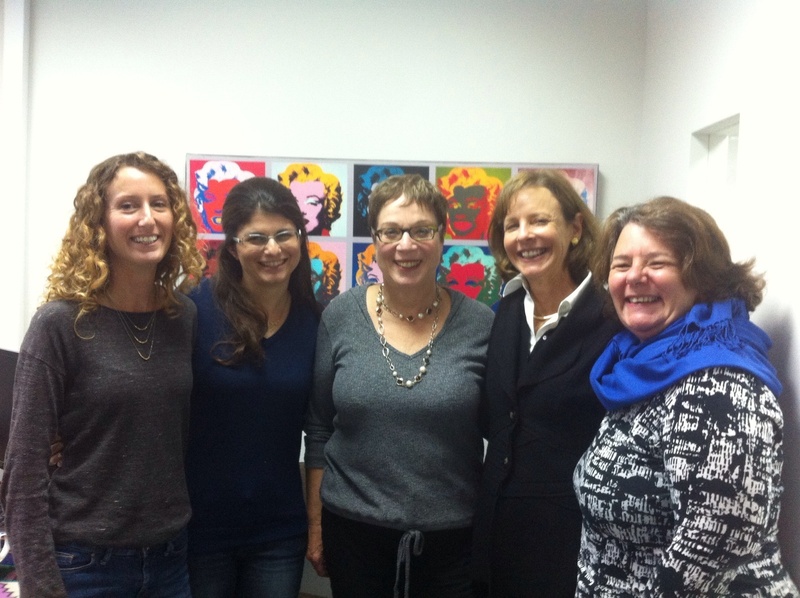 While in Israel for the past three weeks on a family trip, I was privileged to be able to visit two Hadassah Foundation grantees: Women's Spirit, located in Tel Aviv and Hebrew University--The National Council of Jewish Women's Research Institute for Innovation in Education in Jerusalem. 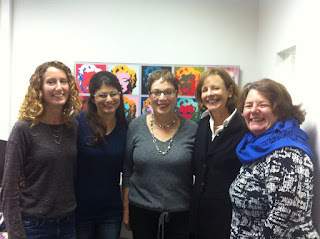 Although, as a member of the Foundation's Board of Directors, I first learned about—and was impressed with--the work of both groups as a member of our Israel Grants Committee, it was nothing compared with actually meeting these organizations' dedicated workers, volunteers, and clients face to face! Women's Spirit provides women victims of violence with the tools and support to re-enter the workforce, achieve financial independence and gain back much needed self-confidence. Much of their work is carried out by a dedicated core of volunteer mentors, who work one-on-one with women seeking to reestablish themselves financially. Michal Gilad, Resource Development Coordinator for Women's Spirit, arranged and hosted my visit to their office where I met with the Director, a volunteer mentor and a client. I spoke with Rachel, a volunteer mentor who explained that after retiring, she wanted to find something meaningful to do as a volunteer. She is currently mentoring T, who was also at the meeting. Rachel said that they meet and speak regularly, as often as T needs the contact, so she can gain the confidence to use the professional tools provided so as to go back to teaching, something she gave up a long time ago while in an abusive relationship. It was obvious that Rachel loves what she is doing, and T explained that without the kind support and encouragement from Rachel, she would not be able to move ahead. I was also so impressed with Michal Gilad and the Director, Aimee Slayter, who are obviously dedicated to the success of this program. I left Women's Spirit feeling so inspired by the depth of humanity and humility shown by each woman, whether professional, volunteer or client. I felt truly honored that the Foundation helps support this organization! My second visit was to Hebrew University--The National Council of Jewish Women's Research Institute for Innovation in Education. For the past several years, the Foundation has supported a program that trains Haredi women to work as professional and para-professionals in early childhood development and education. Finding NCJW's tucked away office Hebrew University was definitely a challenge, but one well worth it! I was fortunate to be invited to join the last class of the course, where I met with the students and the professionals running the program. Dr. Ayelet Giladi, Academic Manager of the Early Childhood Program ran the course and introduced me to the students, ranging in age from 19-37. The determination and dedication of the students became immediately apparent as I heard from two women, both juggling seven children apiece and work commitments. They come once a month to Hebrew University's Mt. Scopus in order to study so as to increase their knowledge and credibility to work with schools, children, parents and social workers in their communities. One woman told me that she is divorced, a mother of two children and lives about 1 ½ hours away by public transportation—she said she comes to the class in order to be able to go back to her community and be more effective when working with children and parents. After visiting both projects, I left feeling so proud to be part of the Hadassah Foundation, and of our support of such worthy projects—I know we are definitely doing work that repairs the world, Tikkun Olam.